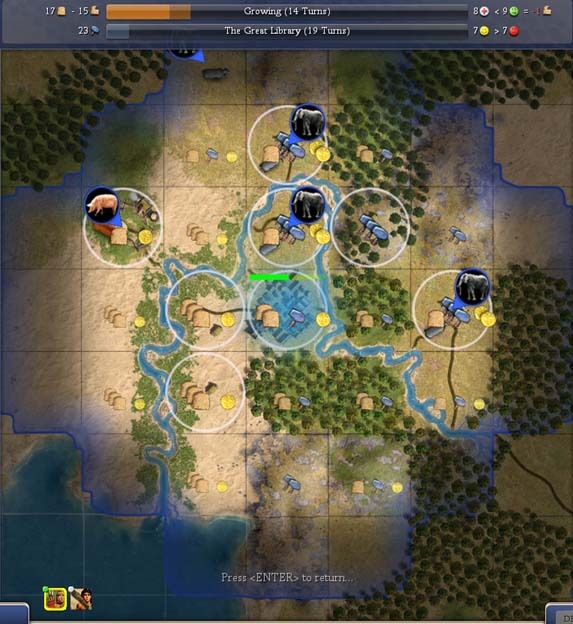 I founded yet another city in the jungle down south to claim several dyes, but now it seemed like I had reached a natural limit for expansion for now. City upkeep costs had become so high (-6gpt) that I had to wait for a better economy before expanding more. So now that I had literature and Washington had produced enough settlers for the time being, I planned to use my civilization traits to their full advantage. Being industrious meant that I would get a significant boost on wonder production, so let's build some wonders! Following my scientific theme, I started to build the great library in Washington, which would provide me with two free scientists. 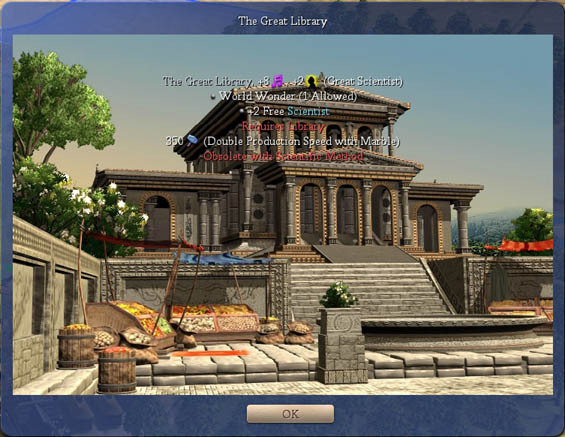 And because I had missed discovering code of laws by two turns only and had no experience with the wonder race in this game, I wanted to construct the great library as fast as possible! I quickly realized that for these special occasions, micromanaging your wonder city can be useful again. As you can see, my hand-tailored configuration would finish the wonder two turns faster, which can make quite a difference on higher levels, and the city would really stop growing. In really dire needs, I even could have configured the city to lose food for some time to produce even more hammers! The governor configuration would still produce excess food, but on the other hand also had more commerce (2gpt). I can't blame the governor for trying to produce at least a little bit of commerce, as this normally would be a very sensible thing - so most of the time, I've come to trust the governor. Only on special occasions, like when you're trying to build a great wonder first and fear competition, micromanaging by hand is still superior. And since Washington hadn't anything useful to build right now, I start building another wonder immediately thereafter: The oracle. Strange that nobody had constructed it yet; I doubt it would still be there on higher levels. Eight turns later, I finish building it and earn a free tech, which isn't automatically the one you're researching right now, but any tech you choose! I pick Civil Service, as it will allow my workers to irrigate tiles that are adjacent to other irrigated tiles. I really like the fact that worker techs aren't an ancient era thing only, but that you will be able to open up more worker options later on as well! This leaves you with more options and decisions to make, always having to adapt to the current situation (do I really need chain irrigation, having to delay this important military tech instead?). It makes the game more interesting that way. Now was also a good time to change civics: I adopt bureaucracy instead of barbarism, which will boost production and commerce in my capital. I also could have changed my labour civic from tribal to caste system, allowing some unlimited specialists, but I'm not sure if that would mean a longer anarchy, and since I don't plan to use specialists much in the near future (a mistake, maybe?) I keep the tribal civic. Not using specialists will also mean nearly no great people (except from wonders), but right now I feel my cities could need growth more instead. Well, I don't know much about this game yet, so I cannot say for sure, but...somehow, the place of the Greek city of Sparta doesn't look right. Maybe I'm missing something here, but wouldn't it have been better to found the city one tile to the north? 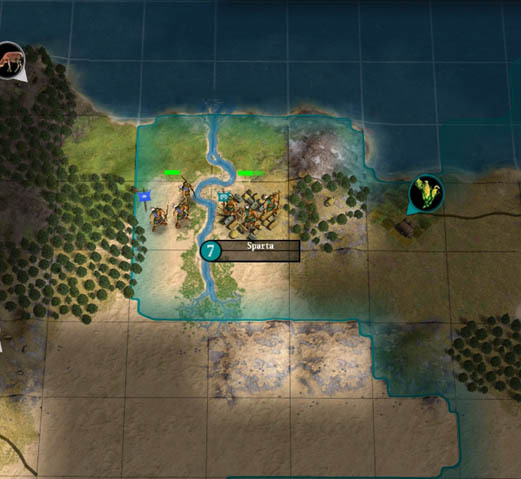 It then would have been on the coast, which looks like to be important in this game, and would only have lost a desert and two hills? I lack experience yet to tell for sure, but somehow this looks like on part of the AI to me. I was starting to build courthouses now to fight city upkeep costs, and this allowed me to found yet another city, Atlanta, near horses and on the coast west of Washington. Then, Merit Ptah was born, a great scientist! This was the first great person I got, so what should I do with him? I could a) create a scientist specialist out of him (+1 hammer, +6 beakers per turn); b) construct an academy in Washington (+50% science output, +4 culture); c) discover a tech with him (mathematics in this case); or d) save him until I get another great person to start a golden age. But since I generated no great person points other than great scientist points at the moment, saving him for a golden age would be wasteful - better use him to any beneficial effect now! Discovering a tech was not so important right now as well, so I decided to construct the academy. +50% science output looked like the best long-term gain I could get with him. Stonehenge was completed in Washington next, and the Parthenon started. 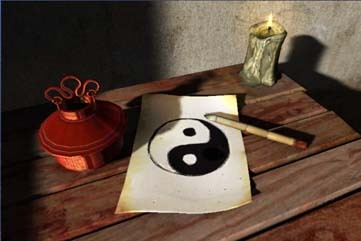 Philosophy was discovered, and finally I was able to found a religion, Taoism! Taoism would bring happiness to my cities, which is needed right now, and I hope it spreads to Greece as well - their cities don't have any religion yet. Relations are only cautious with Alex and he is unable to expand more, so I believe some boost from sharing the same religion would be nice. In fact, we have a -2 modifier on relations right now due to close borders! Not my fault though; he founded some cities near mine. New York is the holy city of Taoism, but founding the religion gave me a free missionary as well, so I spread the religion to my capital city. I could also change civic to pacifism now, which would mean +100% birth rate for great persons, but also +1 gold unit upkeep. I'm not sure my economy could handle this, so I don't adopt pacifism yet, because I don't rely on great persons anyway at the moment.